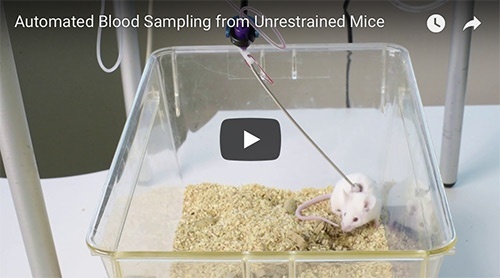 Did you realize it’s possible for a machine to take a blood sample from a freely-moving mouse? How about multiple precise microsamples at pre-scheduled time points, all without needles or any human intervention at all. Not only is it possible, but it’s already happening. As the video begins we see a catheterized mouse taken from group housing and connected to the Instech ABS2 blood sampler. The sampler’s tether is counter-balanced and includes a swivel so that the mouse can move freely around its cage. The tether makes a fluid connection between the sampler and the mouse’s catheter with a simple magnetic snap-fit onto an implanted Vascular Access Button™. return the mixed leading edge to the animal so that blood lost in the process is less than 5µl [0:55]. All without the mouse realizing anything has happened. With automated, hands-off sampling you can take a full PK profile from a single mouse without the stress caused by tail vein, retro-orbital or other acute sampling techniques. Thanks to advances in surgical services, ordering catheterized mice has never been easier. See how automated mouse blood sampling can improve throughput, animal welfare and the quality of your data all in one step.